The most important ingredient for successful recovery from any musculoskeletal condition is rehabilitation, which often requires strenuous and painful exercise regimens for the resident to regain strength and motion in the affected part. Aquatic therapy is an excellent method to use when normal gravity conditions might make the rehabilitation process difficult, painful and even dangerous. Aquatic therapy is a part of a comprehensive approach to gaining safe and functional independence and is used in conjunction with traditional therapeutic approaches. Buoyancy decreases weight bearing which decreases joint compression forces and stress on the connective tissues. These decreases can result in decreased pain with standing activities as well as a quicker return to daily living activities and/or walking normalization. 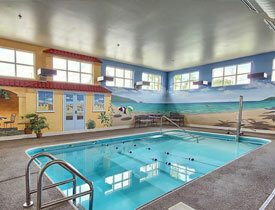 Do you or your loved one need Aquatic Therapy?